Pre-heat your oven for 375. First you will need to do the dirty job of taking all the pits out. There is no easy way to do this, just kind of squeeze them out and then take your fingers and pull. Where the pit once was insert the walnut and cheese. Then take the long piece of prosciutto and wrap the entire date. Repeat for all 20. Cook for about 10-15 minutes keep an eye on them as every oven is different and you don't want them to burn. This looks so good! I needed a new idea for an appetizer for our Friday night get togethers on the bluff...just in time...thank you!! yum! 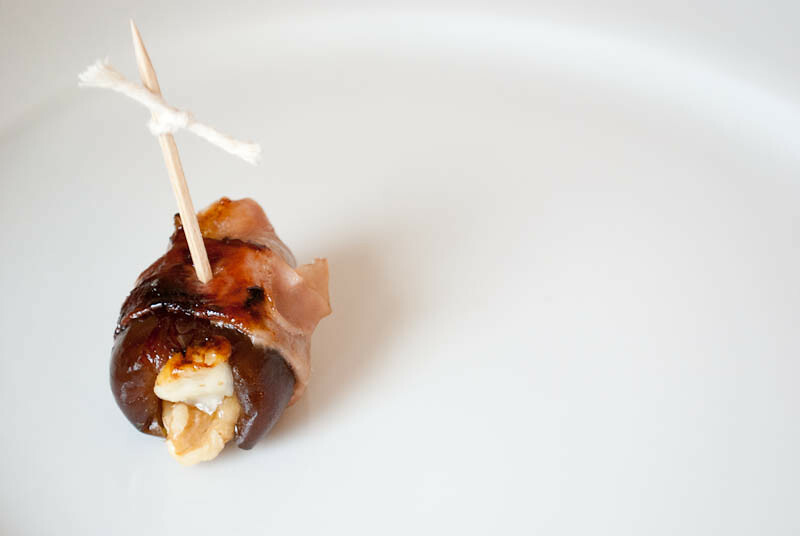 I do something very similar but with a slivered almond and goat cheese (still with the prosciutto or bacon, of course!) and people go crazy for it! I love that, I've had them in the before and I must say I couldn't have just one. They're amazing. these sound amazing! i always stuff mine with an almond and parmigiano reggiano then wrap in bacon, but this sounds better! Oh my goodness. I was already starving; now I'm drooling! YUMMY!!!!! I want one right now please! I'm so glad you posted this! Art and his friend couldn't get enough of them at our felting party. I think I'll surprise him with these tasty treats soon. Yum. My mother makes these and I eat them like they are popcorn. One of my favorites. It is too late to be this hungry.